Like all good farmers, my husband, Tim, is an excellent advanced planner. Last summer he ripped then tilled the rows where the grapes are going to be planted. (To rip = to pull a sub-soiler behind the tractor that has one narrow blade that creates a trench 12-18" deep and an inch or two wide to beak up the layer of hard-packed soil so the water can get into the soil. Usually, you rip multiple times, then till multiple times.) He ripped them again a couple weeks ago. 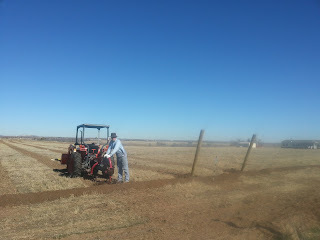 End posts for the vineyard rows. Each one is 10' long and weighs 120 lbs. While it isn't essential that the vineyard end-posts be in place before we start planting, Tim thought it would make sense to have the end-posts in place and run a string down the rows so that our volunteer farmers can plant the vines in a straight line. The rows are each 400-450 feet long, so keeping the grapes in line would be difficult if we tried to eyeball it. Tim and his brawny son, Mike, started drilling the holes for end-posts two weeks ago, but there is a layer of clay a couple feet down that just won't yield to any amount of drilling. Drilling holes for the posts. So, they filled the holes with water and waited. Tim tried again on Saturday, and the drill went right through the clay. Tim is 6'4" tall, so you can see that these posts end up about 3 feet into the ground to hold the weight of the grapes. Two posts in, 22 to go! When mature, a grapevine will yield 22 pounds of grapes, so ... 64 * 22 = 1408 lbs of grapes in a row (potential based on mature vines). You can see why the end-posts have to be planted so deeply and at a 60° angle away from the row. The ultimate nightmare of a vineyard owner is having the posts or trellis collapse during the growing season. There is no good way to get the grapes up off the ground once they are down. If you'd like to come to the Grape-Planting Festival, you have to be prepared to do some work! We are planting >700 grape vines (I know I said 650 the last time I posted, but my husband has ordered more)! Email me: alexis@forbiddenfruitsfarm.com. You have to RSVP to come. I will be feeding the volunteers a Greek meal, so I need a head-count. We will have a sitter or two for children with crafts to keep them happy so parents can help out and kids can stay out of the field. The date is March 23, 2013. I will email you details when it gets closer.